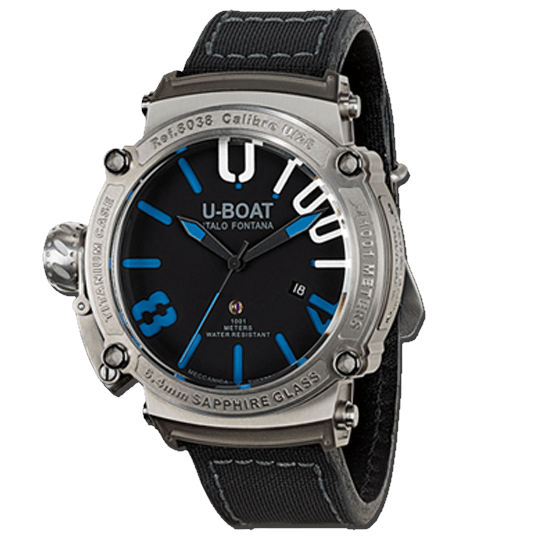 Automatic mechanical, modified and personalised at U-BOAT specifications with stem position at 9 o’clock. Frequency 28.800 vibrations per hour, 4 Hz. Jewels 25. Power reserve 38 hours. Titanium case, thickness 17.30 mm. Distinctive crown on left side with patented protection device (protected as a Trade Mark) and automatic and helium escape valve at 9,45. serial number engraved on a steel plate set on the left hand side of the case. Diameter 47 mm. Back screwed in. The dial of this model is made up of two superimposed dials: one treated with superluminova and blue coloured pigments added and the other one cut, treated with composed opaque black pigments. Arabic numerals, 1001 writing in high relief. Date indicator at 4 o’clock. Special sapphire 6,4 mm thickness,with the profile engraved by laser and additional watertight sealing through the bezel, fixed with 4 screws. In rubber, with lining in calf leather and Kodiak water repellent treatment. Tongue buckle in titanium. An extra strap in calf leather with titanium tongue buckle included. Width 23/22 mm. Fastened to the case through a special quick release system.